Early Christian sculpture and inscribed stones, dating from the 6th century, can be seen right across Wales, from Pembrokeshire in the far south-west to Snowdonia in the north. At Margam, visitors can see an outstanding collection from this one corner of the south Wales landscape, all gathered under one roof. Housed in a charming little building which formerly served as a school house, the collection includes examples of Christian memorials from the sub-Roman era right through to the hugely impressive "cart-wheel" crosses of the late 10th and 11th centuries. The finest monument here is the great Cross of Conbelin, an elaborately and extensively decorated disc-headed cross of the 10th century. Its inscription reads:"Conbelin erected this cross for the soul of Ric". 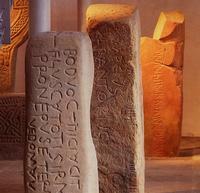 Other notable exhibits include the 9th century Cross of Einion and a 6th century memorial with both Latin and Irish Ogam inscriptions. The collection also includes a number of grave-slabs from the medieval Cistercian abbey at Margam. M4 (J38) Follow A48 towards Margam Country Park. Museum is signposted on left before entrance to country park along a narrow lane.